I'm leaving a lot out of this story to keep it brief and family-rated. 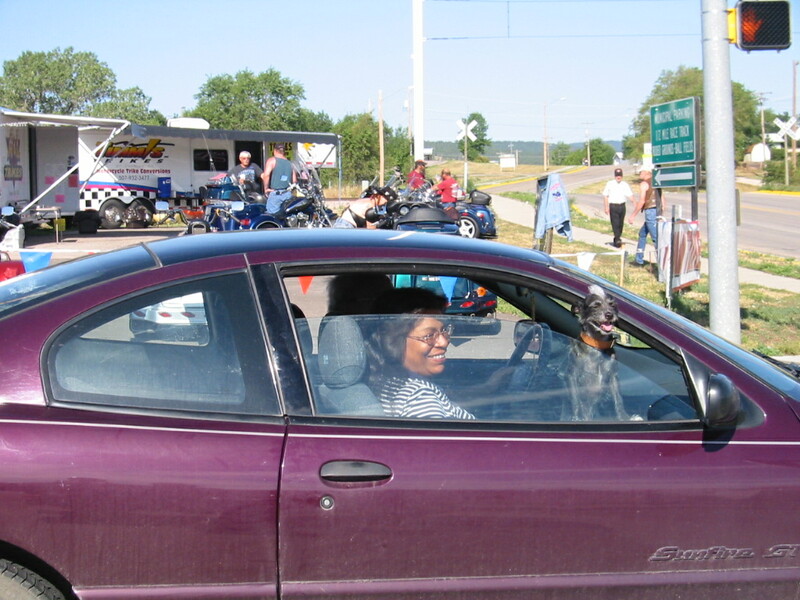 This was going to be my third trip to Sturgis, and it promised to be a little different from the other two trips. I rode by myself the other times, and made the trip from Wisconsin to South Dakota and back in four or five days, pretty much partying the whole time. This time, my lovely wife Julie was riding with me and we planned to make a seven day trip, two-up on the bike, mostly on secondary roads. I spent Saturday evening packing the bike. I packed tools, leathers, a tent, two lightweight sleeping bags, two foam sleeping pads, raingear, and we each packed a small personal bag. That girl is a credit to her gender. I had recently installed a drink holder for her, and some extra tie-down bars, and changed the bike's oil. In spite of the soothing sound of rain falling, I could hardly sleep Saturday night. Sunday morning was gray and damp, but the sky was light in the north where we were headed. I started up our 1987 Harley-Davidson FLTC "Bugzapper" and we were on the road by 8:00 am. It felt great to know that this wasn't just another short hop. We headed north on hiway 53 and drove for an hour before stopping for gas and breakfast at McDonalds in Rice Lake. I like their sausage Mcmuffin with egg, but that's another story. We got back on the road and kept to the speed limit because we saw a few deer munching on the scenery in the ditches. As we got into Duluth, we hit a bird at headlight level and were momentarily engulfed in a cloud of feathers. I think it was a pigeon. There was an airplane doing acrobatic stunts in the air. I enjoy driving over the big bridges in Duluth. As we headed up the hill out of Duluth, my heel shift lever fell off onto the floorboard. I trapped it with my boot and pulled off the road at the first opportunity. The toe shift lever was still attached, and I never use the heel shifter anyway so I threw in in the saddlebag where it remained for the rest of the trip. We went past the iron mines in Virginia, Minnesota and saw huge ore trains rolling down the tracks. I thought some of that iron was probably in the Bugzapper. When we reached Cook, Minnesota we headed west on hiway 1. This was a road that time forgot. It had a lot of ten mile per hour winding turns past abandoned farms, overgrown fields, and scrub forest. We didn't see any traffic for many miles. By now the sky was light and the weather was beautiful. It was still cool so we kept our leathers on for a while. We stayed on hiway 1 thru Northome then across the Red Lake Indian reservation towards Thief River Falls. 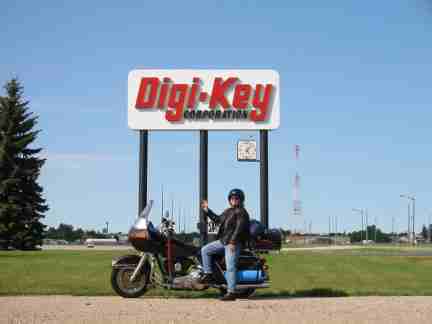 We stopped there for pictures by the big Digi-Key sign. The reasons for this are not clear, but it has to do with computers. We were getting snacks at most of the gas stops, so we were able to keep plugging along until we got to Grand Forks, North Dakota. I had made a reservation at the Best Western motel on 1st Avenue. This would turn out to be the best motel of the whole trip. We ate at Kentucky Fried Chicken then brought a bottle of wine back to the motel and laughed at old Taxi re-runs on TV. It was a beauty day of riding and I didn't have to go to bed lonely. Got kind of a late start - didn't get on the road until 10:00 am. Headed west on hiway 2. The weather was beautiful - sunny and cool. A strong tailwind blew us along, and we had the whole four-lane hiway to ourselves. There were lots of little ponds along the road with ducks and other water birds all around. We saw several groups of large white birds with black wingtips flying in graceful formations overhead. Later, we would find out that these were whooping cranes. Our old bird book at home said they were rare, with only about fifty remaining, but we saw nearly fifty on this day alone. Stopped in Lakota for gas, then stopped in Rugby for burgers and cones at Dairy Queen. Took hiway 83 towards Bismarck. We took a little scenic detour on hiway 1804 which had nice views of the Missouri River. There were elk at a farm near hiway 83, and more big water birds in the river. By now, it was windy and warm. I had a reservation at a Super 8 motel in Bismarck. There was no shampoo and the shower head was only about 4-1/2 feet off the ground, but the room was clean. I got kind of lost cruising around Bismarck, but we finally ended up at a Cracker Barrel restaurant for a late dinner. As we fell asleep, we could hear it starting to rain. When we awoke it was still raining. We hung out at the motel for a while since the rain seemed to be letting up a little. I drank coffee and talked to Rodney from Canada. 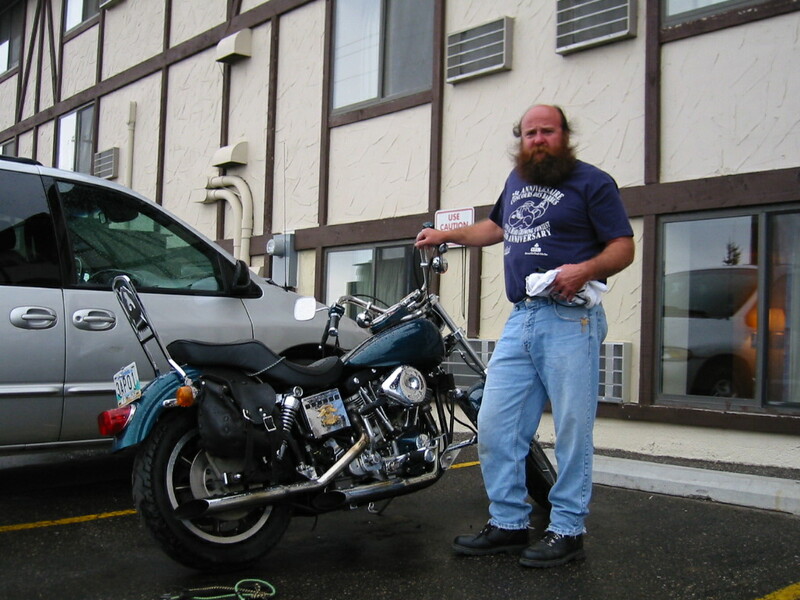 He had driven down from Manitoba on a nice '81 Harley shovelhead, and was also heading to Sturgis. I helped some other crazy Canadians unload a Honda Magna from a pickup truck. They had crashed the Magna the previous day when the rear tire went flat, but nobody was injured. That was fairly amazing since the driver just wore shorts and loafers - no socks! We were going to meet them at Dennys for breakfast, but nobody could find the place. There was a young kid in the group driving a brand new Harley V-Rod. He had some wild stories about the speed that bike could reach. Julie is ready to go. The rain was no more than a drizzle so we took off. We stopped at Gladstone to see the giant iron geese and then pushed on to eat lunch at Applebee's in Dickenson. We would come by here again later due to another one of my screw-ups. Since the day was going well so far, we decided to backtrack a little bit to go down the enchanted hiway and see the rest of the giant iron sculptures. The pheasants & grasshoppers were especially cool. That's Julie standing underneath the grasshopper. 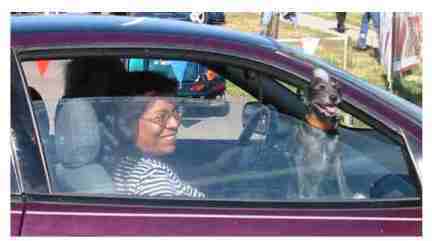 Everybody at the intersection was cracking up. At the campground, I thought the price was kind of high - $48 for two nights, but they have showers and toilets and food and drinks. In addition, the owners are nice people who run a good business. Their breakfasts are excellent! It is kind of a quiet campground and I missed the campfire, but the fire hazard was high because of the droughts. 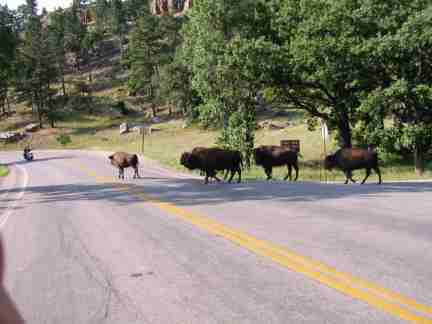 We headed into Sturgis that night and walked the strip for a while. Then we brought a bottle of wine back to the campsite and got back into out tent just as the rain started. It was a great night. The best ever. There was lightning and much needed rain, and the roar of Harleys on the road, and we were both kind of buzzed from the excitement of the day. What a great night. Wednesday morning the sun was shining and everything smelled good from the rain the night before. We ate breakfast at the campground then headed out to explore the area. We gassed up at the Buckhorn bar and met the mayor of Buckhorn, who was a cat. We found ourselves in Wyoming for a while. We got a park pass and drove through Custer state park where we saw buffalo, big horn sheep, and goats. You get to drive through some short one-lane tunnels cut through the rock. We rode the Needles Highway and went to see the Crazy Horse monument. After cruising the canyons we ended up in Deadwood at Pizza Hut in the evening. The service was so slow that they gave us our pizza for free, but a thunderstorm had blown in while we waited for our meal. 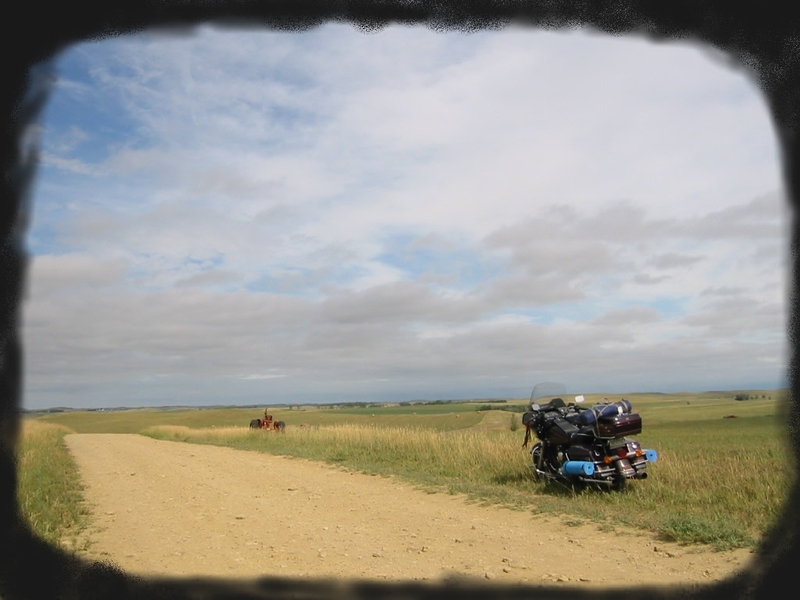 It was nearly ten o'clock when we picked up a bottle of wine and headed back to Sturgis on highway 14A. The storm was blowing pretty good by then and it was hard to stay on the road. The storm blew out some electrical circuits so the town of Sturgis was dark. I tried to talk to a woman on a bike at the gas station by the freeway, but she was in a foul mood. Some people just can't take the weather. We headed back to the tent and drank wine & watched the storm and listened to the bikes, then fell asleep. After the rain last night the morning was sunny and hot. We ate another big breakfast at the camp kitchen then headed back into Sturgis to get some t-shirts and souvenirs. We walked the main drag, looking at the bikes and people. If I had the camera instead of Julie, there would be a lot more pictures of exotic girls. Around noon, we got some lunch then headed out. We stopped for a quick bike wash on the way out. There was an incredible collection of bugs plastered all over the bike. Then we headed back to camp and loaded up all of our gear. It looked like a storm was blowing in from the west so we headed east on I-90. We were just barely staying ahead of the storm when we stopped at Wall Drug. Then it caught up with us. The radio said the winds were 60 to 80 miles per hour, and hail hammered down for about ten minutes. Four by eight sheets of building material were flying through the air. 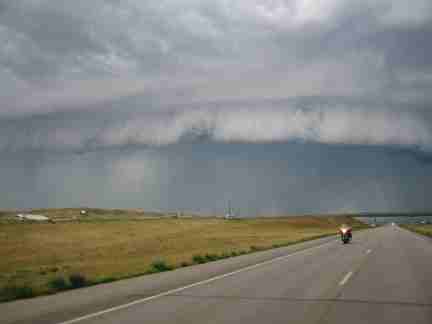 I could barely hold the bike up, so we parked quick at Wall Drug & watched the storm. When it looked like the storm was passing, we headed back out to try to make it to our hotel in Pierre. The wind was pretty strong and we stopped at Murdo for some coffee and pie. It was getting dark and lightening was flashing everywhere. We turned north on hiway 83 for one of the most memorable parts of the trip. It was dark and there was constant lightening, but there was very little wind, rain or traffic, and the temperature was comfortable. The sky and landscape were lit with surreal flashes of light for the entire ride. There was a nice view of the light s of Pierre as we pulled into town and found our motel. It was grey and damp but comfortable when we headed out from Pierre to see the Oahe Dam. 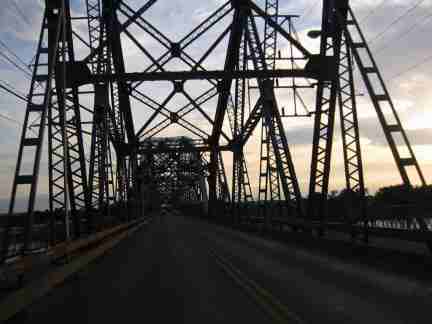 Then we took a beautiful road (hiway 34) along the Missouri river to Fort Thompson. We stopped at an unusual gas station on the reservation. It didn't have any windows, even on the heavy steel door. There was a poster for "Rumble on the Rez", an all-star wrestling show. When I went inside, there were about thirty Indians in the place socializing and buying stuff. There was one huge Indian who looked like a wrestler. Little kids would run up to him, boost themselves up by grabbing his shoulders, then throw fake punches at his head. He would just go "Rrrrrr" and swing his arms around to peel the kids off. He looked like he could throw a kid about 75 yards if he wanted to, but they were just having fun. I bought some beef sticks that were really good. We stopped for gas again in Madison then pressed on to Sioux Falls. I didn't have a motel reservation but we got one of the last rooms at the Cloud 9 motel. I always like motels that have semi tractors parked outside because they usually have laundry and other services available. The people in the room next to us were bikers named Kurt & Dawn from Santa Fe, New Mexico. I wish I had pictures, because they had some of the nicest tattoos I have ever seen. Dawn operates Four Star Tattoos in Santa Fe. 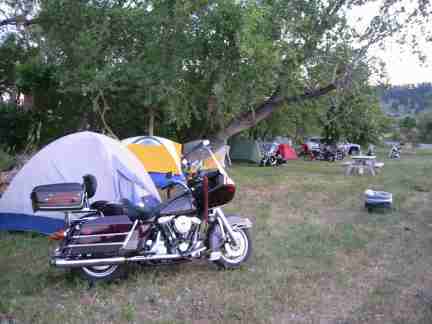 They were traveling all over the country on a nice black 2001 Harley FLH. Julie and I went to eat at Codys, which was a rip off. We picked up another bottle of wine to take back to the motel, where we hung out talking to other bikers, then watched the "Thomas Crowne Affair" on TV for a while. Julie really thinks that Pierce Brosnan is hot stuff although he doesn't bear much resemblance to me. We got up and traded tales with Kurt & Dawn for a while, then headed east on I-90. We turned north on hiway 23 which detoured onto hiway 30 and hiway 91. We stopped at a county park on Lake Shetek where we saw some more big white whooping cranes with black wing tips. We stopped for gas in Russell and then stopped for lunch at a Dairy Queen in Granite Falls. Took hiway 67 to Morgan. We took hiway 60 into Wabasha. That is a fantastic road! Brand new blacktop, plenty of banked winding curves, and beautiful scenery. The motels in Wabasha were booked so we headed north on hiway 35 along the Mississippi river to Redwing, where the motels were also booked. It was getting late but we decided to crank it all the way back home to Eau Claire so we took hiway 10 to Durand where we picked up hiway 85 to Eau Claire. I really kept my eyes peeled for deer along these roads. We got back to Eau Claire at about ten p.m. and headed for the Stone's Throw bar to listen to the Blue Heat band and have a beer or two to celebrate a great road trip. Then it was home to our own beds. Our kids weren't home but some of their friends were over at the house. They seemed kind of surprised to see us since we weren't due back until Sunday. Technically, it was Sunday already. We went in the house and saw the remains of some hilarious cooking experiments and it looked like some partying had gone on, but things were basically O.K. We hit the sack and quickly fell asleep. What a great trip!